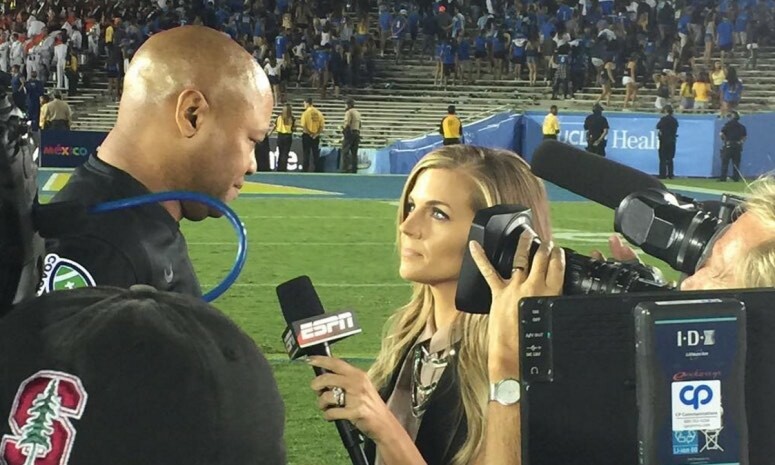 Sam Ponder’s role at ESPN may soon be expanding well beyond her normal coverage of college sports. Chris Berman’s recent reassignment off of ESPN’s cornerstone NFL studios shows creates a huge hole in the network’s coverage of its most popular sport. Could “College GameDay” reporter Sam Ponder be in line to replace him? Berman served as the host for “Sunday NFL Countdown,” “Monday Night Countdown” and “NFL Primetime.” According to James Miller, author of the book, “Those Guys Have All the Fun: Inside the World of ESPN,” responsibility for hosting the three shows will be split among current ESPN personalities Ponder, Suzy Kolber and Trey Wingo. Chris Berman's @ESPNNFL role will be split up. Hearing @sam_ponder gets Sunday Countdown; Suzy Kolber MNF & @wingoz doing all #NFL draft. Specifically as it relates to Ponder, hosting “Sunday Countdown” would make it extremely difficult and unlikely for her to continue in her present role on “College GameDay.” Consider, “Countdown” films at the ESPN studios in Bristol, Connecticut Sunday mornings following the Saturday morning on-campus “College GameDay” broadcast. This logistical hurdle might be the least of the objections to filling both roles as the strain of preparing for two of ESPN’s crown jewel studio shows on back-to-back days in two different sports and locations could prove overwhelming to anyone. It’s also unusual for studio hosts to take on lesser, supporting roles with other programs. Ponder and her husband, San Francisco 49ers quarterback Christian Ponder, also have a 2-year-old daughter, Bowden Sainte-Claire Ponder. Accepting both jobs would mean more time away from her family. Miller mentioned that none of the reported deals have been completed as of yet, so it could just be speculation. On Berman @espnnfl replacements — deals not done.